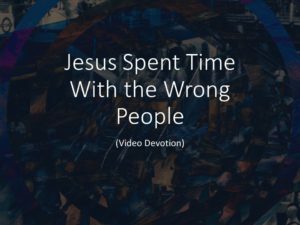 The religious leaders of didn’t understand why Jesus spent time with people who weren’t like him. The religious elite of the day lived in perpetual fear of being contaminated by the world. Jesus’ actions went against everything they were about. It seems that Jesus was more concerned about imparting his holiness to the world then being contaminated by the world’s ungodliness. This is good news! I have met a lot people who live in fear of what they might “catch” from the world. You don’t need to live in fear! Jesus challenges his followers to be the salt of the earth, the light of the world, a city on a hill! Thanks Dave! I appreciate your kind words. Loved it!!! Thank you Mike..
Hey thanks Mike! I am glad you got something out of it!